Sometimes you have a database full of data, but you do not want to use that exact data. This may be due to personal data like addresses or phone numbers, or it may just be to avoid sending notifications to real users during testing. The data randomizer is a way to move data that is real to a test or development table or to modify real data to make it safe for other uses. It replaces real data with data that looks real but is not. This is the home page for the data randomizer application. Your first question is likely, “What is That?” and it is an answer to a need. Over the years, I have come across numerous situations where I have a database full of data, but I do not want to use that exact data. This may be due to personal data like addresses or phone numbers, or it may just be to avoid sending notifications to real users during testing. 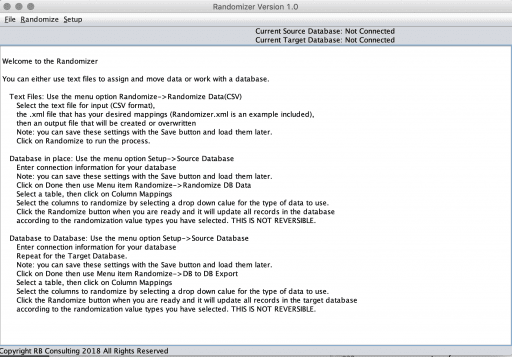 The data randomizer is a way to move data that is real to a test or development table. In other words, it helps you modify production data to make it safe for other uses. Please note that this is not a form of encryption nor can is there a path back from randomization to source data. This is a java application and there are two versions included when you download the zip file. One is a GUI application and the other is a command line version. Both of these work in an identical fashion so you can interchange them as needed for your purposes. The steps for the GUI application are listed in detail on the main form. The command line version has an overview or you can see the detailed instructions on this page. 2. Randomize a database table in place. 3. Randomize a database table to the same table in another database. 2. Select the text file for input (CSV format), the .xml file that has your desired mappings (Randomizer.xml is an example included), then an output file that will be created or overwritten. Note: you can save these settings with the Save button and load them later. 3. Click on Randomize to run the process. 5. Select the columns to randomize by selecting a drop-down value for the type of data to use. according to the randomization value types you have selected. THIS IS NOT REVERSIBLE. 6. Select the columns to randomize by selecting a drop-down value for the type of data to use. and then insert new ones according to the randomization value types you have selected. THIS IS NOT REVERSIBLE.